I’d never heard of Raising Cane’s until I visited my girlfriend out in Las Vegas, where she lived at the time. She seemed baffled that I’d never even heard of the place, since I’m such an insufferable food nerd. But back in 2016, there weren’t any remotely near Chicago where I live. So we went, gloriously hungover, considering when you’re in Las Vegas you’re permanently hungover. Raising Cane’s—named after the owner’s yellow lab—is a fast food chain, and the only thing they sell is chicken fingers. They also serve one sandwich—which itself is three of those chicken fingers between a Kaiser roll. There are only three sides: crinkle-cut fries, coleslaw, plus a thick piece of Texas toast—Lobster roll-fluffy—that’s essentially a glorious sponge for garlic butter. But that’s it. No grilled chicken patties appeasing healthy types or unnecessary filler rounding out the menu. And when a restaurant specializes in one thing, it better be good. I’m going to say it right now: These are the best fast food chicken fingers out there. If anything, I avoid chicken fingers; they’re usually dry and boring, more a battered utensil for lifting sauce to your mouth than anything else. I’ll take a poorly cooked piece of bone-in fried chicken over a chicken finger any day. Raising Cane’s fingers, despite being white-meat tenderloins, are drippingly juicy. That may sound vulgar, but it’s no exaggeration. My cooking instincts suggests that they’re brined with just enough salt that I want another bite immediately. What’s interesting is that the flavor in the fingers lies almost entirely in the chicken itself, not the breading. My coworker Travis (we’re both restaurant cooks in the same kitchen) describes the breading as nearly cornflake-like, which is an apt comparison. The craggy breading doesn’t contain a lot of seasoning, but that cornflake crunch, which doesn’t reach the nearly cartoonish heights of Popeye’s, strikes the right balance with the juicy chicken. Each order comes out blazing hot from the Canola fryer, and there’s never been a trace of old reused oil flavor. Something to note is that they are fairly small, so I usually go for four rather than three. There’s only one dipping sauce (creatively named “Cane’s Sauce”), which is a pink mayo-ketchup blend, spiked with a lot of black pepper and Cajun-tinged “secret spices.” You know, one of those dead horse marketing shticks where they use the smug “if we tell you what’s in it, we have to kill you” attitude. 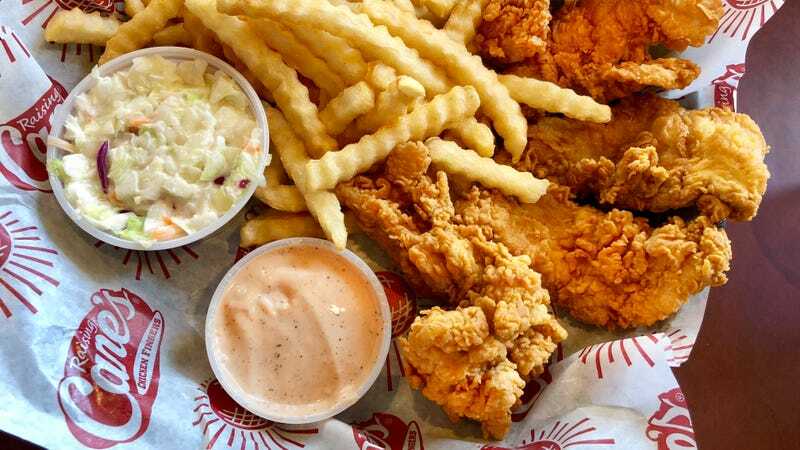 It’s nothing you haven’t had, but what Cane’s sauce really does is bring everything together in one bite. It pairs perfectly with the fries and Texas toast, too, which is an added bonus. As to locations, they’re not quite as big as, say, Chick-fil-A, but they seem to be growing quickly. When my girlfriend moved back to the Midwest, we both lamented the fact that we couldn’t get Raising Cane’s near Chicago, but that changed last year, and a handful sprung up nearby. So if there isn’t one near you, my guess is that may change pretty soon. When it comes down to it, yes, they’re just chicken fingers. But dammit, I had them for lunch today and I’m craving more. You have no idea how much I hate that.